**Special offering the Week 5 - Cooking and Creativity. It’s a half day program in collaboration with The Cooking Lab - ART & COOKING! :) Sign up soon because space is limited. 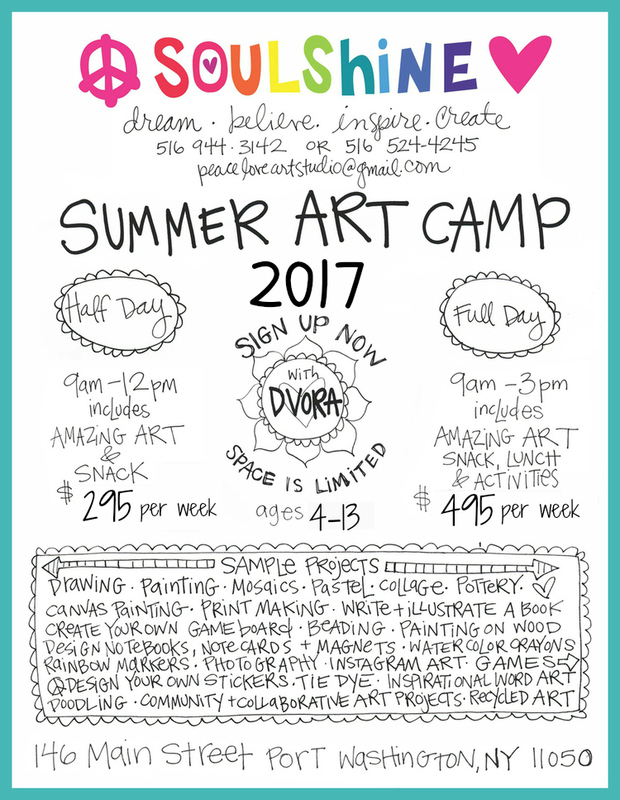 (cooking and creativity week is $450 for the joint program 9am-12pm) All other prices and info for Soulshine Art Camp are below. EARLY BIRD Special Details below!!! Pay in FULL by April 22nd and receive a discounted rate! Select the number of weeks NOW but decide which weeks later. More details when you click on sign up buttons below. EARLY BIRD FLEX WEEK SPECIAL below!! *important - Please include the week/s you are signing up for in the special note section (under the billing information) when checking out. Early Bird pricing ends April 22nd!! Pay in full now for however many weeks you like and you don't have to select which weeks until June 1st! Early bird price is $270. After April 22nd it increases to $295. Sorry, no exceptions. Our full day art program includes everything the half day includes plus lunch out at different local restaurants, a cooking class a week at a local restaurant, activities, some times outside and lots more ART!! Early Bird pricing ends April 22nd!! Pay in full now for however many weeks you like and you don't have to select which weeks until June 1st! Early bird price is $460. After April 22nd it increases to $495. Sorry, no exceptions. During our Art Camp sessions we often find time to free draw and laugh! ...and of course we are almost ALWAYS listening to awesome MUSIC to help INSPIRE us! We reserve the right to cancel camps or classes at any time due to change in availability and/or low enrollment.